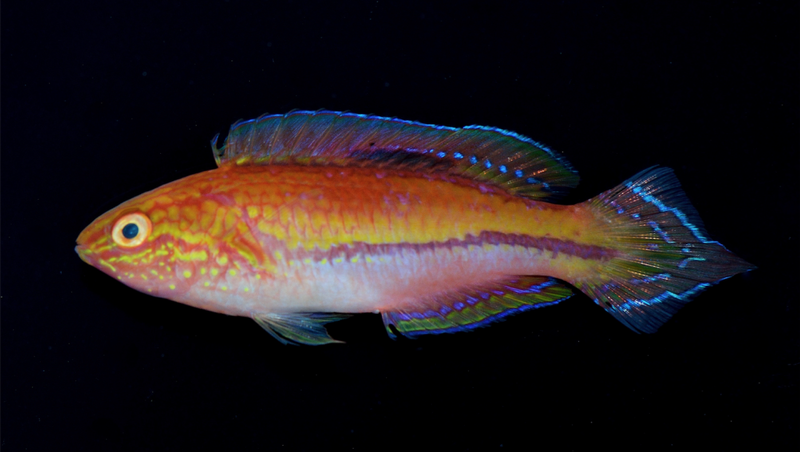 Cirrhilabrus isosceles, fresh paratype, ZRC 54775. Note the blue markings on the caudal fin which converge to form an isosceles triangle. Photo credit: Lemon TYK. Cirrhilabrus is undeniably one of my favorite labrid genera, and so it comes as no surprise that today’s instalment of epithet etymology highlights yet another species in this speciose genus. 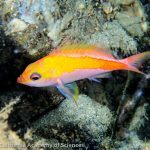 Today’s fish in focus is Cirrhilabrus isosceles, the pin-tail fairy wrasse. 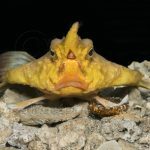 This particular species is special to me for various reasons, but perhaps the one closest to my heart, is that this was the first fish I described in a paper with Hiroshi Senou and Brian Greene earlier this year. Prior to that, C. isosceles has been taxonomically undescribed for close to two decades, despite being recognised as new. 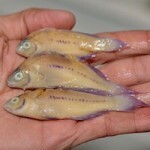 Throughout this time, it was assigned numerous tentative names, including Cirrhilabrus sp, Cirrhilabrus sp 3 and Cirrhilabrus cf. lanceolatus. 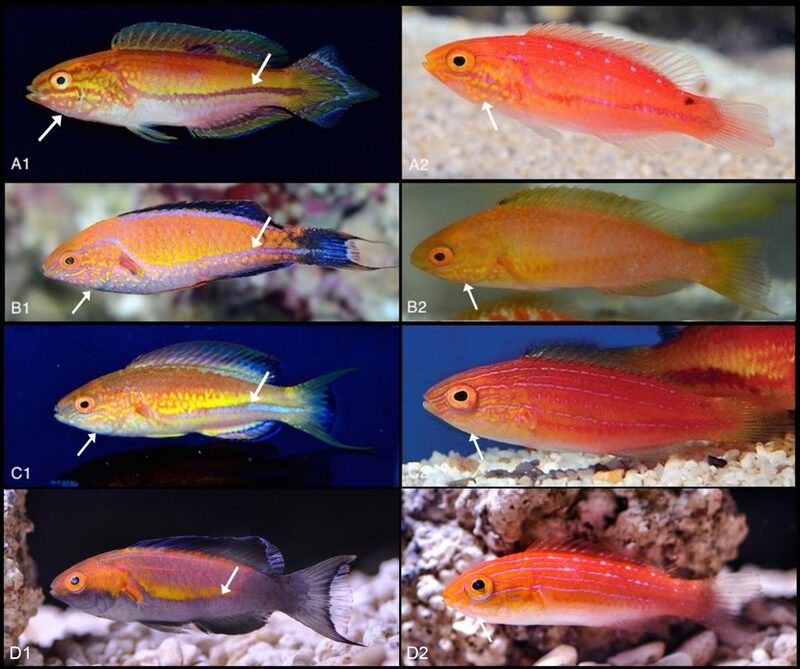 Live color patterns in Cirrhilabrus species (TP males in A1-D1, initial phase in A2-D2). A: C. isosceles, Fuga Island, Cagayan (A1=paratype AMS I.47150-001); B: C. cf. 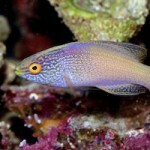 lunatus, Fuga Island, Cagayan; C: C. squirei, Great Barrier Reef; D: C. lunatus, Okinawa, Japan (A1, B1: Y.K. Tea; A2: K. Kohen; B2: B. Shutman; C1: R. Lanceley; C2: F. Walsh; D1, D2: E. Fleishauer). 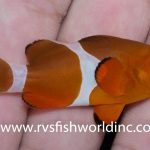 Despite its unusual caudal fin morphology and gross resemblance to C. lanceolatus, we now know that C. isosceles is actually a member of the lunatus species complex, which includes a collection of rather small species with highly recurved, crescentic caudal fins. This resemblance can be seen quite clearly in the terminal males, who share similarities in color patterns and other subtle nuances, such as nuptial display patterns. Analyses of the mitochondrial COI sequences have revealed that C. isosceles, as well as the other lunatus group members, share nearly identical sequence data. Even more interesting is the dissimilarity in sequences between C. isosceles and C. lanceolatus – the latter instead sharing a lineage alongside C. jordani, a species with rounded caudal fins. It becomes quite clear now, that the classification of Cirrhilabrus based on caudal fin morphology is not as reliable as once considered. Cirrhilabrus isosceles, holotype, with a blue triangle drawn on the caudal fin. Photo credit: Hiroshi Senou. Coming up with a name for this species was challenging. I wanted a specific epithet that would allude to its characteristically pointed tail. However, both rhomboidalis (latin for rhombus) and lanceolatus (latin for lancet) have already been taken (by C. rhomboidalis and C. lanceolatus). After going through several potential names, I eventually settled for isosceles. The word isosceles stems from the greek word isoskeles, which is the combination of the words “isos” for equal, and “skelos”, for leg. Basically, isosceles, in reference to the geometric isosceles triangle, simply implies that it has “two equal sides”. Going back to the fish, this can be seen pretty clearly on its caudal fin, with the broad blue markings converging at the tip to form a nice triangle of equal sides!